It is placing a deflated balloon in the stomach using endoscopy and then filling it to decrease the amount of intragastric space. It can be left in the stomach for a period of 6 months and results in average weight loss of 10-15 kg in half a year. It may be used in patients who are overweight and not coming to the category of sleeve gastrectomy. If you suffer from Metabolic Syndrome and have tried various treatments without results, metabolic surgery may be indicated. At present, surgery combined with behavioral changes is the only documented method for achieving long lasting weight loss for patients with morbid obesity. A silicon balloon is placed in the stomach, under endoscopic guidance. 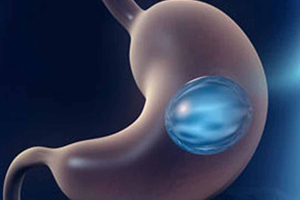 A gastric balloon aims to reduce feeling of hunger and helps to feel fullness of stomach. The intragastric balloon device is not considered a permanent weight loss procedure. There are different types and sizes of balloons in the market. All balloons are temporary and need to be removed after a period of time (6-12 months). Class II obesity (BMI 32-37) in whom surgery is not possible due to medical conditions or patient’s dislike for surgery. In Morbidly obese (BMI > 37) as a procedure before bariatric surgery to reduce surgical morbidity. Any patient with an excess weight of 10 -20 kg (BMI 23-27.4), with failed dietary measures especially in cases with PCOD (Polycystic Ovarian Disease) and infertility. The insertion of balloon does not require surgery. You will be supported by a multidisciplinary team that includes a bariatric surgeon, a gastroenterologist, a dietician and an anaesthesiologist. Discussion about various procedures. You may ask any questions that you feel are necessary. 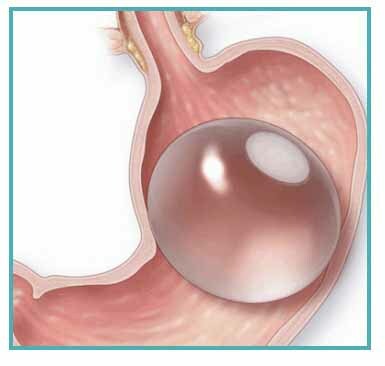 The team confirms that intragastric balloon is a good option for you. After this you may be advised investigations and consultations that are felt necessary for the assessment of your health condition. ECG, X-Ray Chest PA, USG abdomen, Dexa Scan. During the initial days of the insertion of the balloon, nausea, vomiting, abdominal pain, acid reflux are common. Your doctor would prescribe medications to minimize gastritis. Medicines for nutritional supplementation/ multi-vitamins may not be generally needed. You can contact the doctor during the following days. You have to have food as prescribed by the dietician. It is important to drink more water to avoid dehydration. Some patients take a light meal. A radiograph of abdomen or abdominal ultrasound is rarely indicated for persistent abdominal pain. Nutritional assessment is done after one month and three months. A consultation (in person or by phone) every month will be scheduled. The consultations help to assess the progress of weight loss. The first consultation is scheduled a week later. Nutritional and behavioral modification is the key to loose weight and keep it off after removal of the balloon. Your physical activity is evaluated and diet is adjusted to your body needs and profession. A psychological treatment may be necessary in case of eating disorders. Removing the balloon is carried out after 6 months. The balloon is no longer effective because the stomach has adapted to it. The gastric secretions make it porous and then it can deflate. The gastric balloon is removed the same way it has been introduced - through the esophagus and mouth - without surgery. The removal is performed under mild general anesthesia under endoscopic control. The removal lasts around 15 minutes. The balloon is punctured and the fluid or air is removed and then the empty balloon is brought outside. How much weight can I loose with gastric balloon? The balloon is an effective aid for losing weight in combination with diet and eating behavior modification program. Dietary counseling is done monthly and sometimes more frequently if needed. The weight you lose will depend on your motivation and the quality of diet. The balloon is not an appetite suppressant. This an effective aid for the modification of habits and eating behavior. The weight loss is between 10 and 20 kg for 6 months when the balloon is in place. After its removal the weight maintenance and prevention of weight regain will depend on how you adapt long-term lifestyle changes in eating and exercise. It is therefore important to continue the diet plan after removal of balloon.